Shopping for Cars Wall Murals? Cross the finish line with Cars! 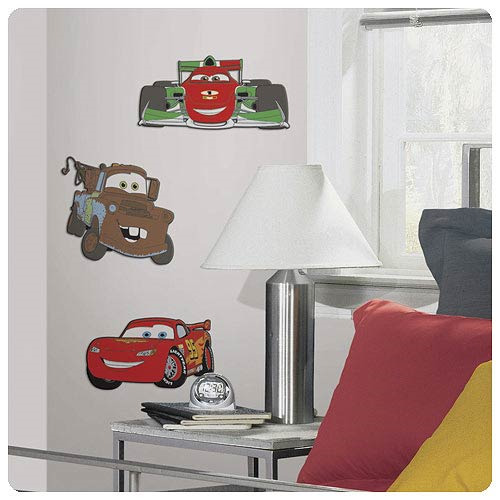 These 3-D foam decals are a great way to bring your child's favorite Cars characters into any room. Application is simple: just remove the backing and press each character to the wall. A quick and easy way to decorate in any location. Lightning McQueen decal measures over 9 1/2-inches wide x nearly 5 1/2-inches tall; Mater decal measures over 8 1/2-inches wide x nearly 7 3/4-inches tall; Francesco Bernoulli decal measures over 10 3/4-inches wide x over 5 1/2-inches tall. Ages 4 and up.